For Arkansas floods in June 2010, see 2010 Arkansas floods. The May 2010 Tennessee floods were 1,000-year floods in Middle Tennessee, West Tennessee, south-central and western Kentucky and northern Mississippi areas of the United States of America as the result of torrential rains on May 1 and 2, 2010. Floods from these rains affected the area for several days afterwards, resulting in a number of deaths and widespread property damage. Nashville, Tennessee, suffered extensive flooding, especially in areas close to the Cumberland River, Mill Creek, and Harpeth River. Two-day rain totals in some areas were greater than 19 inches (480 mm). The Cumberland River crested at 51.86 feet (15.81 m) in Nashville, a level not seen since 1937, which was before the U.S. Army Corps of Engineers flood control measures were in place. All-time record crests were observed on the Cumberland River at Clarksville, the Duck River at Centerville and Hurricane Mills, the Buffalo River at Lobelville, the Harpeth River at Kingston Springs and Bellevue, and the Red River at Port Royal. A significant weather system brought very heavy rain and severe thunderstorms from Saturday, May 1 through Sunday morning, May 2. A stalled frontal boundary coupled with very moist air streaming northward from the Gulf set the stage for repeated rounds of heavy rainfall. Many locations along the I-40 corridor across western and middle Tennessee reported in excess of 10 to 15 inches, with some locations receiving up to 20 inches according to Doppler radar estimates. Several rainfall records in the Nashville area were broken during the rain event. 13.57 inches (345 mm) fell during the two-day period of May 1–2, doubling the record of 6.68 inches (170 mm) set in September 1979 during the passage of the remnants of Hurricane Frederic. On May 2 alone, 7.25 inches (184 mm) of rain fell, including 7.20 inches (183 mm) during a 12-hour period and 5.57 inches (141 mm) in a 6-hour period, eclipsing records set on September 13, 1979. The event also set a record for wettest May on record, surpassing the record set in May 1983 with 11.84 inches (301 mm). Heavy rain also affected large portions of Arkansas, northern Mississippi and southern Kentucky. In Arkansas, over 5 inches (130 mm) fell in the Little Rock area, up to 8 inches (200 mm) in West Memphis and over 10 inches (250 mm) in northeastern Arkansas closer to the Mississippi River. Similar amounts were recorded across western and southern Kentucky where over 7 inches (180 mm) fell in the Hopkinsville area and up to 4 inches (100 mm) across the Missouri Bootheel. In addition to the heavy rain, moist air and ample instability contributed to the generation of multiple tornadoes affecting the same areas, which killed five people: four in Mississippi during the early hours of May 2, and one in Arkansas during the evening of April 30. Twenty-one deaths were recorded in Tennessee, including ten in Davidson County, which includes Nashville. Of the ten dead in Davidson County, "four victims were found in their homes, two were in cars and four were outdoors." Floods killed six people in northern Mississippi, and four deaths were reported in Kentucky. At least 30 counties in Tennessee were declared major disaster areas by the federal government, with 52 applying to receive this status. This translates to about 31% of Tennessee being designated a major disaster area. Almost all schools in the area were closed including Metropolitan Nashville Public Schools, some for a week or more. Many roads were damaged by water erosion. Interstate 40 west of Nashville had numerous spots that had been inundated. Repair work on I-40 continued for several months. The first site of major flooding was along Mill Creek in southeastern Davidson County, which was affected by a flash flood on May 1. The creek quickly spilled over its banks, and completely covered Interstate 24 near Antioch, killing one person in a car. A TDOT traffic camera captured footage of a large portable building being swept away from Lighthouse Christian School and coming to rest among the traffic on I-24, which was broadcast live on local television. Another person was killed along Mill Creek while attempting to tube the floodwaters. Flooding on the Cumberland River damaged the Grand Ole Opry House, Gaylord Opryland Resort & Convention Center, Opry Mills, Bridgestone Arena (home to NHL team Nashville Predators), and LP Field (home to NFL team Tennessee Titans) with several feet of water. Grand Ole Opry performances were moved to other venues in the Nashville area, with the Ryman Auditorium serving as the primary venue when available. Other venues hosting the Opry include the War Memorial Auditorium, TPAC's Andrew Jackson Hall, Nashville Municipal Auditorium, Lipscomb University's Allen Arena and the Two Rivers Baptist Church. Both the Ryman and War Memorial Auditoriums were previous homes to the Opry. None of these facilities were affected by the floods. The Grand Ole Opry House reopened to much fanfare on September 28, 2010. The basement flooded in Schermerhorn Symphony Center, causing the destruction of two Steinway grand concert pianos and one organ valued at $2.5 million. The common areas of the Gaylord Opryland Hotel were destroyed, and parts of the hotel were under 10 feet (3 m) of water at the peak of the floods. It remained closed until November 2010. The studios of WSM radio, located in the Gaylord Opryland Hotel, were also flooded. This forced the station to broadcast from a makeshift studio at its transmitter site in Brentwood for six months. WSM's administrative offices next to the Grand Ole Opry House were also completely destroyed and later demolished, resulting in the loss of several priceless documents from the station's history. Neighboring Opry Mills mall was also inundated, and remained closed until March 29, 2012. Flooding was reported in a mechanical room of the Country Music Hall of Fame and Museum, but the exhibits were not damaged. The playing field, ground level facilities (such as locker rooms), and service entrance of LP Field were under water. 40 feet (12 m) of water filled the underground parking garage of The Pinnacle at Symphony Place, a 417-foot (127 m) tower in downtown that opened in February 2010, less than three months before the flood. Electric and elevator systems housed in the garage were damaged. In Belle Meade, an upscale neighborhood of Nashville, the ground floor of St. George's Episcopal Church was flooded. In the early morning of May 4, flooding at a Nashville Electric Service substation caused power to go out in the center of the city. Among the buildings that lost electricity was the 617-foot (188 m) AT&T Building, the tallest building in Tennessee. Power was not expected to be restored until Friday, May 7. The newsroom of WTVF was flooded and nonoperational for 3 months. Equipment was hastily moved during the flooding and set up at various locations around the building. The Harrington water treatment plant, one of two in the city, flooded and the other was spared by mere feet; on Monday, May 3 residents were ordered to restrict water use, a situation that lasted for about a month. The Dry Creek wastewater treatment plant in Madison was flooded with some equipment areas under more than 40 ft of water. Disinfection was quickly restored but recovery efforts required about a month to restore full operation to the major plant processes. Nashville/Davidson County was declared a Federal Disaster Area on May 4. According to Nashville Mayor Karl Dean, damage estimates in Nashville totalled $1.5 billion not including damage to roads and bridges or public buildings, as well as contents inside buildings and residences. The Duck River at Centerville exceeded its record level by almost 10 feet flooding or destroying homes, roads, and agricultural land. One person in Hickman County died from drowning. Numbers of people who were stranded on I-40 sought refuge in Centerville. The Cumberland River in Clarksville flooded many businesses along the river. Flooded businesses were closed for up to seven weeks. All schools in the Clarksville-Montgomery County School System were closed for one week. The Community Foundation of Middle Tennessee has raised $14 million from individual donors and is being allocated in various grants. The Metro Nashville Disaster Response Fund has received roughly $3.5 million, the Tennessee Emergency Response Fund around $5.5 million, the River Fund $5 million, and other relief efforts have received $234,000. The River Fund was created with proceeds from Garth Brooks' December 2010 concerts for flood relief and serves the 52 flood-affected counties in Tennessee. On June 22, 2010, a benefit concert called "Nashville Rising" was held at Bridgestone Arena to raise money for Middle Tennessee flood relief efforts. The concert raised over $2.2 million for flood relief efforts. American singer Taylor Swift donated $500,000 during a telethon hosted by WSMV. 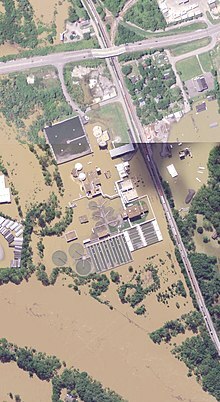 Wikimedia Commons has media related to 2010 Tennessee floods. ^ "United States Flood Loss Report - Water Year 2010" (PDF). National Weather Service. 2010. p. 1. Archived (PDF) from the original on July 6, 2013. Retrieved June 30, 2013. ^ Marcum, Ed (May 6, 2010). "Knoxville's height would help if city were hit by a Nashville-like flood". Knoxville News Sentinel. Archived from the original on May 9, 2010. ^ "Weekend Rainfall Totals". National Weather Service. Archived from the original on May 5, 2010. Retrieved May 3, 2010. ^ a b "Epic Flood Event of May 2010". National Weather Service. Retrieved May 4, 2010. ^ "Total of 13 Tornadoes So Far from the May 1–2 Outbreak". National Weather Service. Retrieved May 7, 2010. ^ "Flood of May 2010". NWS Nashville. Archived from the original on May 29, 2010. Retrieved May 9, 2010. ^ "Severe Weather/Heavy Rain on April 30 - May 1, 2010". NWS Little Rock. Retrieved May 9, 2010. ^ "Rainfall Accumulations for the April 30 / May 2 Heavy Rainfall Event". NWS Paducah, KY. Archived from the original on May 9, 2010. Retrieved May 9, 2010. ^ "State-wide Status report, issued at 3 p.m. May 7, 2010". Tennessee Emergency Management Agency. Retrieved May 7, 2010. ^ "Storms, Floods Kill 29 in South". Wall Street Journal online. Archived from the original on May 9, 2010. Retrieved May 4, 2010. ^ "Miss. storm death toll rises to 6". Clarion Ledger online. Retrieved May 4, 2010. ^ "Bredesen Announces Disaster Declarations for 3 More Tennessee Counties". Tennessee Government. May 7, 2010. Archived from the original on May 13, 2010. Retrieved May 7, 2010. ^ Mullen, Bryan (May 3, 2010). "UPDATED: LP Field, Bridgestone Arena flooded". The Tennessean. Retrieved May 4, 2010. ^ a b c d e "Nashville landmarks underwater". Tennessean online. Retrieved May 4, 2010. ^ Snyder, Eric (May 3, 2010). "MetroCenter dry, Pinnacle Tower swimming; most office areas escape flooding". Nashville Business Journal online. Archived from the original on May 7, 2010. Retrieved May 4, 2010. ^ Reisinger, Brian (May 4, 2010). "Power out in core of downtown Nashville". Nashville Business Journal online. Archived from the original on May 7, 2010. Retrieved May 4, 2010. ^ "WATER: Conservation not working; city's reserves dip to 37 percent capacity". The City Paper. May 4, 2010. Archived from the original on September 16, 2016. Retrieved September 9, 2016. ^ "Obama declares Nashville a disaster area". The Tennessean. May 4, 2010. Retrieved May 7, 2010.